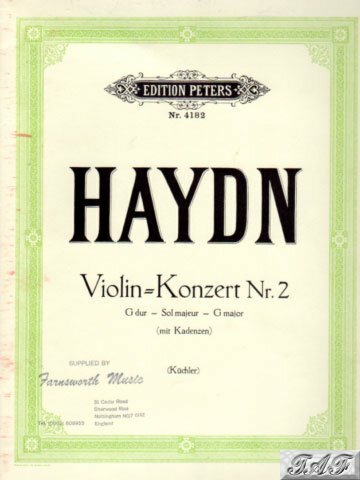 A good quality Peter's Edition copy of Haydn's Violin Concerto No 2 in G Major arranged by Ferdinand Kuchler. This copy is the piano reduction and includes the cadenza. The piano part is clean and possibly unused, while the violin part has a number of pencil marks on the score. The cover of the piano part has some markings on the spine that it looks as if it has rubbed against a red book at some time and there are a couple of palm prints on the back cover. The book is in generally good condition and would pass off as "shop soiled" in a music shop sale. Any questions, please feel free to get in touch. Make an instant payment for the full price (£7.50 plus £2.00 postage) directly to the seller's PayPal account.